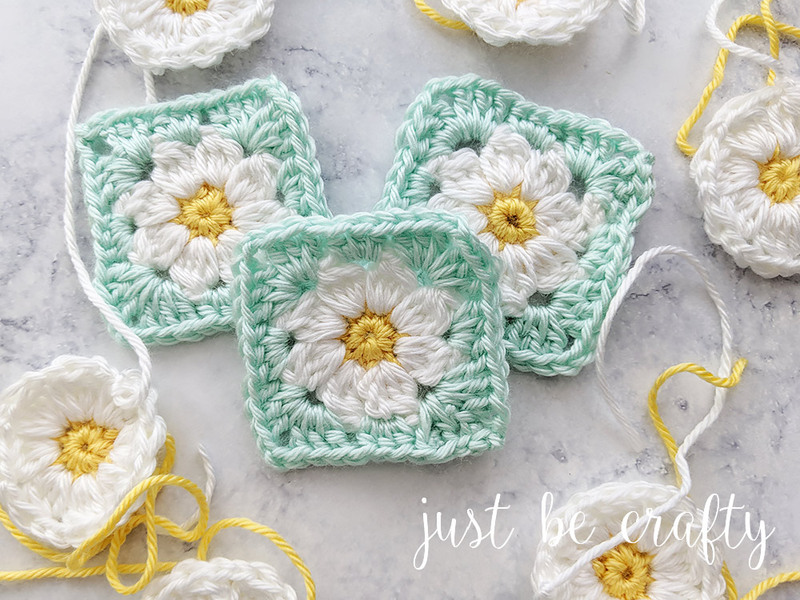 The Dainty Daisy Granny Square is a beautiful crochet motif that’s perfect for spring! 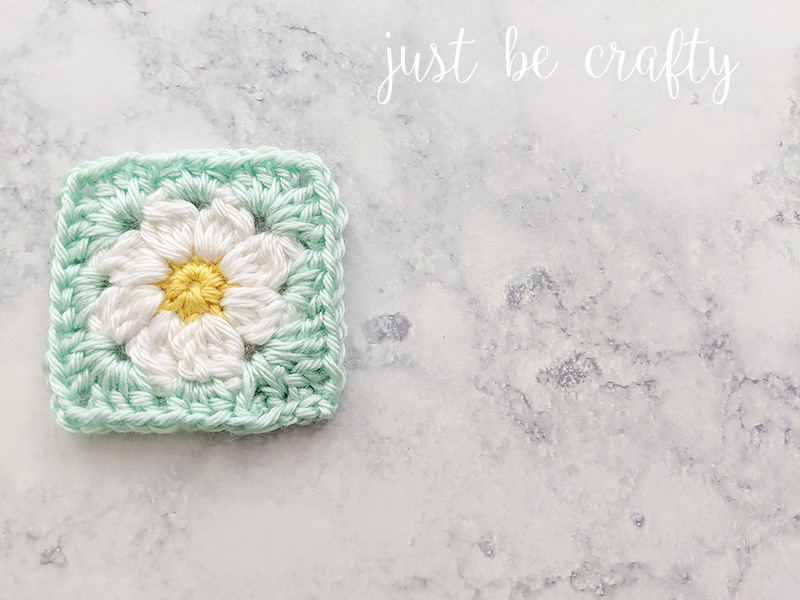 Learn to crochet this square along with me in the step by step video tutorial. 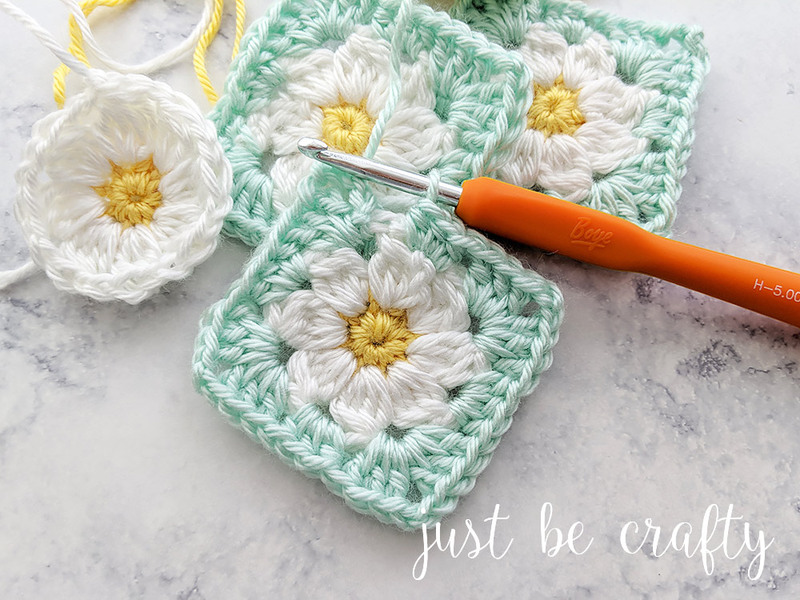 The Dainty Daisy Granny Square was inspired by a vintage crochet blanket that used to rest on the back of a loveseat at my family’s camp. I remember using this blanket as a kid, and letting my hands rest on those delicate daisies. I’m not sure who made the blanket (I will need to find out!) but it is so beautiful! I’m not really sure what made me think about it, maybe spring flowers in bloom – I’m not sure! It’s probably been a good 15 years since I’ve even seen this blanket, waaay before I was ever crocheting so I unfortunately have not idea how it was constructed. I was playing around with daisy designs trying to make something similar but I just couldn’t get it and I’ve never seen another pattern like it. 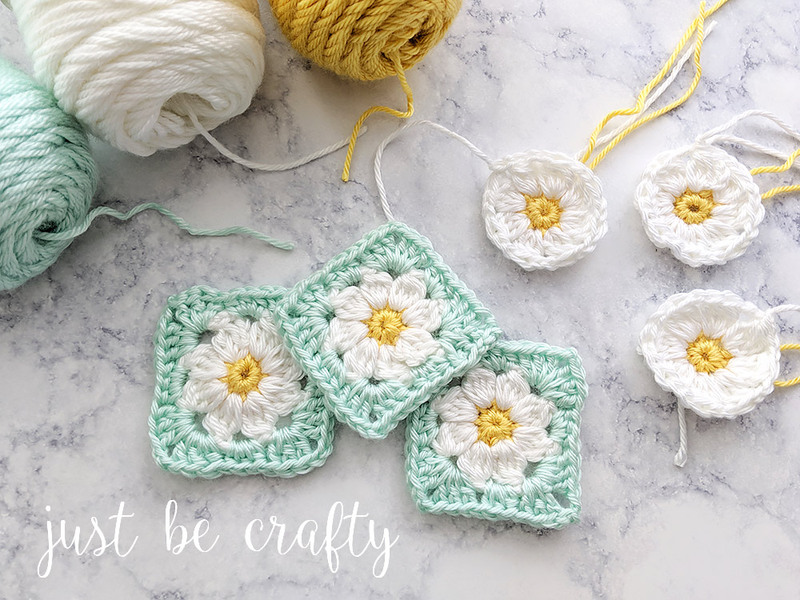 As a result of trial and error, the Dainty Daisy Granny Square was born. This square is just going to have to do for now until I can get my paws on the original blanket! Though I love my little square and think it’s cute, it just doesn’t do the original blanket justice. From what I remember it was not a granny square design. I will definitely report back if I ever see the original again OR get my hands on that pattern! For this project I used the lovely Caron Simply Soft in colors Sunshine, Soft Green and White. I chose this yarn for its beautiful colors and soft squishy feel. Any blanket made with this yarn will make you want to wrap up and never leave the couch! You’ll be ready to tackle this pattern after mastering the above skills! Tip: Make your squares in batches of 5 or 10. Meaning, make 5 or 10 of the flower centers at a time before moving onto the second and third rounds. 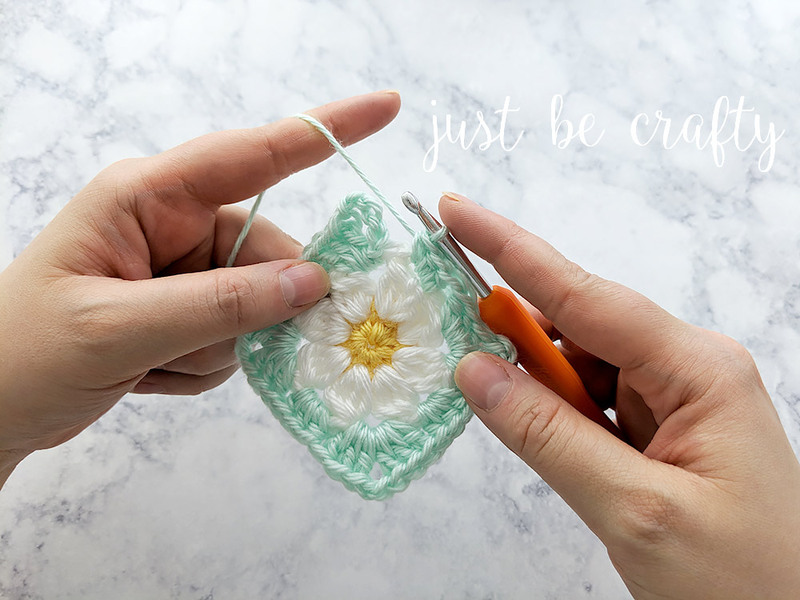 Batching your squares will help you move forward on your project quicker because you get the instant gratification of completing a bunch of squares at once! Chain 3, *YO, insert hook into stitch, draw up a loop, YO, pull through 1st two loops on hook; repeat from * 2 more times into the same stitch. YO, pull through all 4 loops on hook. Chain 2. Remaining Petals – in next stitch: *YO, insert hook into stitch, draw up a loop, YO, pull through 1st two loops on hook; repeat from * 3 more times into the same stitch. YO, pull through all 5 loops on hook. Chain 2. Repeat the above Remaining Petals instructions 6 more times. You should now have 8 petals. Join with 1st petal of the round with a slip stitch. Round 3: In any chain space, attach Soft Green and chain 5 (counts as a dc and ch2), make 3 dc in same space, make 3 hdc in next ch space, *(make 3 dc, ch 3, 3 dc) in next ch sp, make 3 hdc in next ch sp; repeat from * 2 more times; make 2 dc in 1st corner stitch, join round using slip stitch into the 3rd ch of the starting ch, sl st into ch sp.